Every business is different. Select from a wide range of property metrics to personalise your dashboard with the key indicators that drive your business. At a glance, you and your team can see where herds are located. The list of moves due today or overdue, based on the current grazing plan. Confirm or defer a move in one click, or drill in to enter detailed observations against the graze. See a summary of current herd locations, days in paddock, paddock rest days, and feed taken so far. See the upcoming paddocks according to the grazing plan. Make decisions about whether to move sooner or later. Record your rainfall easily. See the current rolling 365 day rainfall, the current months rainfall and the last rainfall event. View today’s rainfall, or go directly to the rainfall entry and metrics page in one click. Multiple rainfall sites are supported per property. Enhance communication amongst the team. Keep an eye on what’s going on by viewing the list of recent activities. It’s like a news feed for your ranch. 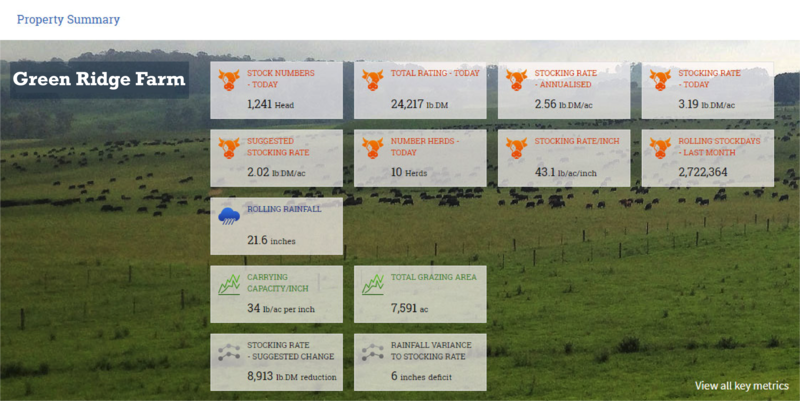 MaiaGrazing uses algorithms to determine the suggested optimal stocking rate and makes it easy to manage your stocking rate so as to maximise production without eating into reserves. The benefit is higher profits, improved land quality, and resilience to drought. MaiaGrazing learns what an individual farm can do – and then uses this information to forecast future performance based on expected future stocking rates and rainfall scenarios. It’s not a static view of feed versus stock which quickly becomes out of date – it forecasts future scenarios taking into account the cumulative effect of past grazing activity on the farm and the climatic conditions experienced. MaiaGrazing can help farmers plan rather than react – this enables informed and confident decision making, taking advantage of market conditions and better overall farm management. Being able to see into the future with MaiaGrazing’s forecasts means that risk is minimised and tough times can be planned for, making grazing decisions to maximise profit. MaiaGrazing brings precision agriculture to the livestock and grazing space. At a glance, covering any time period during production, a rancher can understand where their production is actually coming. This information can be harnessed to identify areas which may be underperforming which qualifies where investment may be directed. No more paper grazing charts and complex spreadsheets. 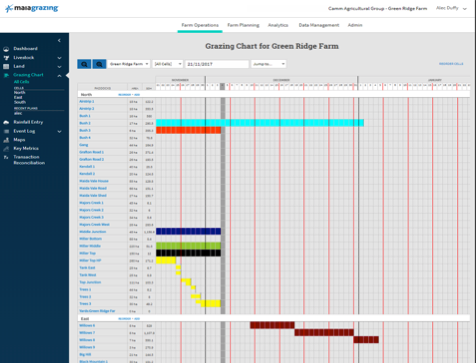 The grazing chart in MaiaGrazing displays all the grazing records for the property over time, including any planned grazes for the future. By clicking on any graze represented in the chart you can drill down to the specific grazing record and notes taken about the graze as well as make adjustments if required. Like with everything in MaiaGrazing, data only needs to be entered once and any changes update all related records for the property. The grazing chart also provides a simple to use interface where users to make quick plans for future grazes for particular mobs in particular paddocks.